Wilkes Morse learns Spanish from his Kindergarten teacher Yessenia Infante, Wednesday, Dec. 5, at Dillon Valley Elementary School. Most Americans are used to thinking in English. Trying to learn how to think and understand the world in a different language is a very useful skill to acquire, especially for kids who want to fly out of their Summit nest to explore the world. For the past 14 years, Summit School District has been helping students become global citizens with a dual language program that has classes taught in English and Spanish, opening up new avenues of thought and opportunity while also building stronger relationships between different cultures and communities. Summit’s dual language program began at Dillon Valley Elementary back in 2004. The voluntary program has grown, and has also been adopted by Silverthorne Elementary along with Summit middle and high schools. This summer, several members of the Summit High School Class of 2018 became the first crop of students to participate in the dual language program from kindergarten to high school graduation, experiencing the entirety of their K-12 education in two languages. The program is founded on three fundamental pillars. First, to teach children to become bilingual and biliterate — being able to read, write, speak and understand two different languages. The next pillar is high academic achievement in both languages. The third pillar is improving socio-cultural competence, bringing kids from different backgrounds and cultures together to learn from each other. Kendra Carpenter, principal of Dillon Valley, said that the program is an “additive” benefit for all of Summit County, where demographics have kept shifting over the years. The same is true for the country, which according to the U.S. Census has barely 20 percent of the population speaking in more than one language. Compare that to Europe, where more than half the population knows more than one language. The dual language program has students learning the same classes in two different languages. One week of instruction might be in English, the next in Spanish, alternating between them. Some courses have also alternated languages for each class session. Carpenter said the system works quite well in different subjects. For example, if a student is learning math in the dual language program, the basic concepts are the same — addition, subtraction and other math principles are universal. There are merely different terms used to express the same concept, and students in the dual language program have taken to the system quite well. 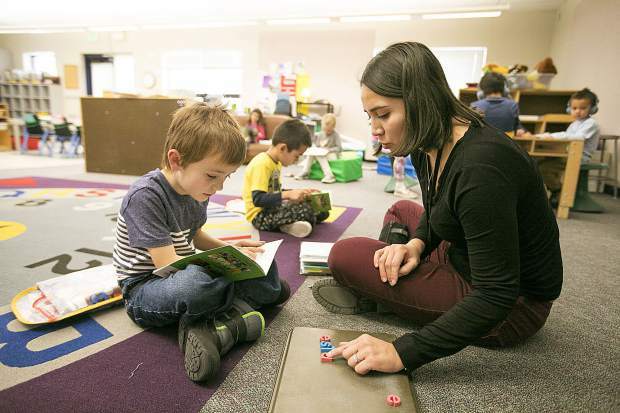 Yessenia Infante, who teaches Spanish kindergarten at Dillon Valley Elementary, said she has also seen remarkable interactions between students in the dual language program, improving confidence for kids across the board. Joel Rivera, principal at Silverthorne Elementary, said that the recent introduction of dual language programming in his school has already produced results when it comes to student confidence. Carpenter added that primarily Spanish-speaking parents have also been more involved in their children’s education with the dual language program, and parent involvement is known to improve academic achievement for their kids. There have also been improved overall connections between the Spanish-speaking and English-speaking communities as a result. Rita Tracy, language development and equality coordinator for the district, said that cultural connection is very important.